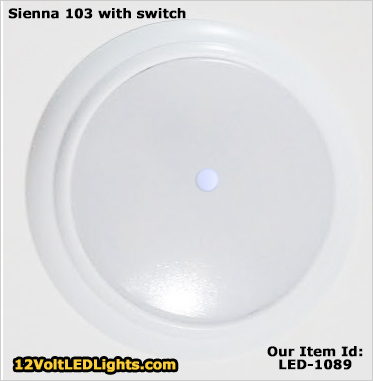 The 3 inch diameter 12 Volt LED Puck Light "Sienna 103" with optional switch is a Surface Mount fixture with an Extremely Low Profile of only 0.6" (with the optional switch) - for comparison, a dime is 0.705" in diameter. This round plastic light fixture has a soft white lens with an optional switch. The optional switch is compact and protrudes through the lens. This minimizes the overall height of the fixture except for the optional switch, enhancing the low profile benefit, especially important if you have a low ceiling and need a surface mount fixture. This LED ceiling light offers a bright light output for such a thin profile, making it a welcomed product for rv interior lighting or boat interior lighting. The light output is 204 lumens and compares to a 30 watt incandescent bulb or 13 watt halogen. The soft white lens produces an even light pattern without glare or shadow. I bought this to replace a cheaper one that died on me after only two outings. It was installed as a under cabinet light above a prep counter but ended up being the perfect night light for my Granddaughter whose bed is across from it. Even though it looks exactly like the one I replaced you could tell the difference right away in the quality of the circuit board. I expect this one to last many years. The low profile is perfect for under cabinet lighting and it is bright enough to see what you are doing at the counter but low enough that it does not light up the whole trailer disturbing everybody else's sleep when left on at night. The LED draws so little amps I am not concerned about it drawing down my battery. 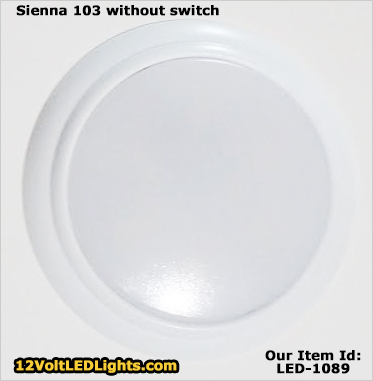 When my other cheap one dies I will not hesitate to buy another Sienna 103 puck light. These puck lights are indeed compact and unobtrusive in the confined spaces of an RV. The switched version I have is simple but appears to perform well. My only concern is (or was) initial removal of the lens for mounting. After some examination I gingerly inserted a small blade screwdriver between the exterior ring and lens which eventually popped off without apparent breakage. Second and subsequent removals were easier as I realized it was better to insert the screwdriver above one of the bezel ring slots near a mounting 'bump' on the lens. I recommend the manufacturer add a slip of paper with instructions in order to minimize the risk of breakage. Note from 12voltLEDLights.com: Jim, thank you so much for the great advice regarding the lens. We will now ship the fixtures with the lens aside, so the fixture can simply be installed, and then the lens can snapped into place. Puck worked as advertised. Lots of light for a small package. Love the center push on/off switch. Surface mount allowed minimum modification to ceiling. Ordering was easy and delivery was on time. Perfect replacement for the reading light in my RV. The light was easy to install and works great. Great delivery on the part as well. Buy Now For: Out of stock. Discontinued.